It's a fact! 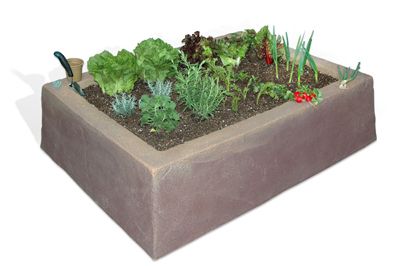 ...Raised garden beds are attractive, easy, and fun to use. Best of all, they produce more and healthier flowers, vegetables and herbs. Raised bed gardeners know this fact. They are the most successful growers you will find. Looking for great looking flowers, and a bountiful vegetable harvest? Then, a raised bed garden is for you. Plastic raised garden bed frames consist of heavy-duty plastic landscape timber and corner brackets. Plastic landscape timber is by far the most common material. They are long-lasting, retaining an attractive appearance. Cedar boards, wood boards or wood landscape timbers are also commonly used. The downside, is that they have a limited life, and lose their neat and tidy appearance fairly quickly, as they age. Important note: Avoid pressure treated lumber or landscape timber for frames in gardening raised beds. While pressure treated wood lasts longer than untreated wood, they can contain harmful chemicals that can leach into your soil. Why are growers much more successful using raised gardens to produce spectacular crops? The elevated surface allows for good drainage, especially during wet spring weather, and summer downpours. The soil in your raised bed frame warms up earlier in the season. This promotes earlier and more successful seed germination, and healthier early season plants. Ease of use - It's easy to access to the elevated garden. Senior citizens and people with handicaps find much easier to work with. It makes gardening easier on the back and knees. People who have a raised bed garden, are more avid gardeners who take pride in their gardens. Raised bed frames do not have a bottom- The root system of many plants root grow much deeper than the height of the raised garden frame. Don't restrict the root system, in its search for water and nutrients. For use on a balcony or deck, a bottom for the frame is a necessity. Place the frame on top of a sheet of plastic or a plywood board. Or, line the inside with heavy duty plastic sheeting. Also see models for decks. 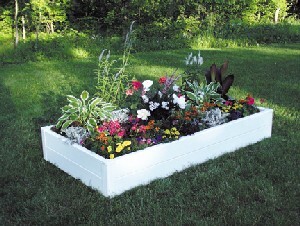 Guarden brand raised vegetable and flower bed frames are the most popular units on the market. They don't skimp on material, which affects the strength of the plastic timber. Unlike other models, the 4' X 8' Guarden raised bed frames are so strong, they do not need a center support that gets in the way of you and your plants. Senior citizen and assisted living facilities place a sheet of plywood atop sawhorses. The frame is placed on the plywood, and filled with soil. Use smaller sizes on balconies, decks, patios and high rise rooftops. Just place a piece of plastic sheeting under the frame. 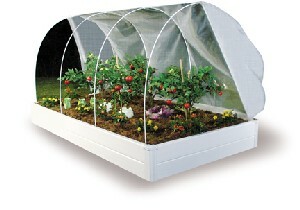 Fill the frame with soil, and you are ready to garden almost anywhere. 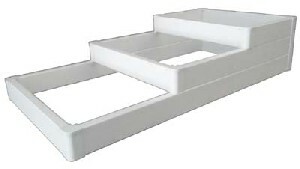 Plastic raised bed frames come in a variety of sizes. They can be single deep (5 1/4" high), or extra deep(10 1/2" high), using one or two plastic timbers. Extra deep models, are by far the most popular. The extra height makes it easier to work and harvest your plants. 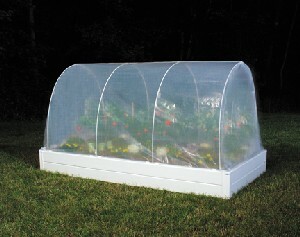 Add a cover system to your raised garden bed, and you have.... both a cold frame, and a hobby greenhouse! This raised bed kit comes with a cover system. The cover latches firmly to the raised bed frame, allowing it to withstand high winds. The plastic cover comes standard with the unit. The cover system helps to extend the gardening season spring and fall. It's easy to remove the cover system, for summer months.